No such luck this time around another wasted opportunity! The usual mixed bag against the Bluebirds in Cardiff, mostly the same sorry outcome though, AWFUL! As I chose not to travel up to Bristol to stay with my buddy Rio and then off to Cardiff as I had something on in London this evening, I am giving this biased review via live radio comentary. 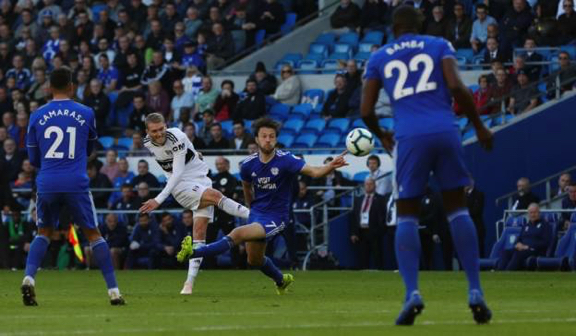 By all accounts it's the usual fare, both teams obviously desperate to win and the opening exchanges see Cardiff pushing the Super Whites all the way. Bamber is a completely animal, don't know why the ref doesn't have a word. Then the ball goes out to Schürrle who does it again with a superb right foter to give us a welcome away lead. Eleven minutes played and we're one nil up away! As usual, our non-existent defence play to form and Cardiff equalise through Murphy on16 minutes. Six minutes later, Cardiff's Reid puts Warnocks Welshmen a goal up, doom and gloom from our misfiring mob. Thank the Big Alien in the Sky for Sess, his collection of a nice flick from Mitro (once again, he's had no service) sends hi through to convert a good finish under the olf fulham goalie, Neil Etheridge to bring us right back into the game. The misfiring and yellow carded Calum Chambers i subbed for Alfie Mawson. Cue, more dirty stuff from both sides and more inept defending but somehow we survice fourr added minutes to go in at the interval on equal terms. Mitro is constantly fouled and Seri goes off for Floys Ayite, an attacking move from Slav. 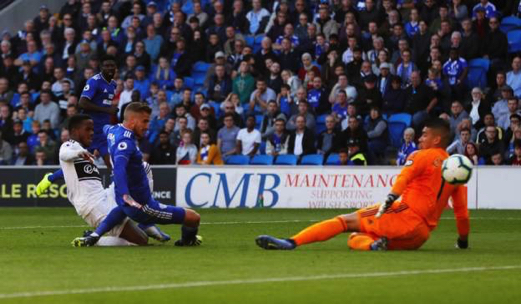 Disaster, Callum Paterson gets Cardiff's third goal, another soft and easily preventable catastrophe. However despite another dreadfully nervous defence showing, we look dangerous on the ball, we just need to hang onto it and make it count, the big question is, when will this defence settle? Ayité fouled as it appeared he'd be able to run in on goal, ref awards a free kick on 15 minutes left just outside the area, Schürrle to take. Needless to say he fluffs it. Vietto replaced Johansen on 82 minutes, on the evidence of the last two games, he could add something worthwhile to our attack. 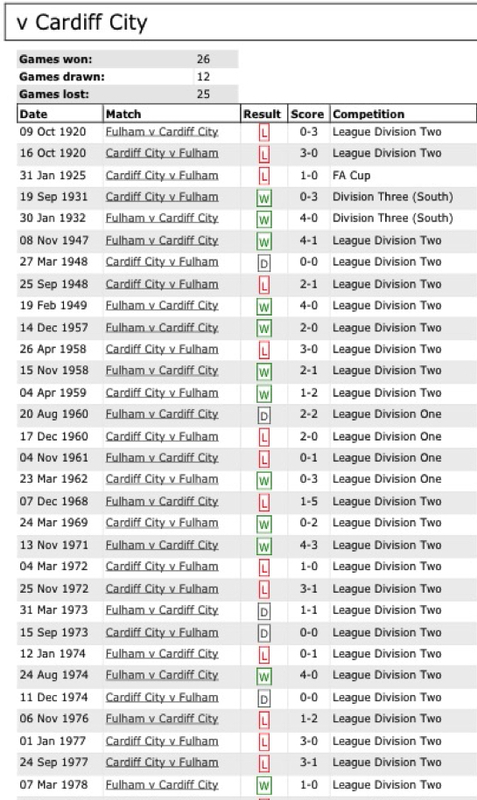 A galling thought, if we lose this, we replace Cardiff in the bottom three, Yuk! A Fulham corner on 84 minutes after a promising attack, Mawson's well struck and powerfiul header brilliantly saved by our ex-goalie, blast it! That's the end of that, Cardiff score again through Harris, a Ream error sets the miserable sequence into action. Amazing how £100.000.000 can turn the best ide in the Championship into one of the three worst in the Premiership, tat's some sort of record! As I wasn't there in person, I don't feel justified in saying what I really feel about another hapless performance but the results this season are awful. 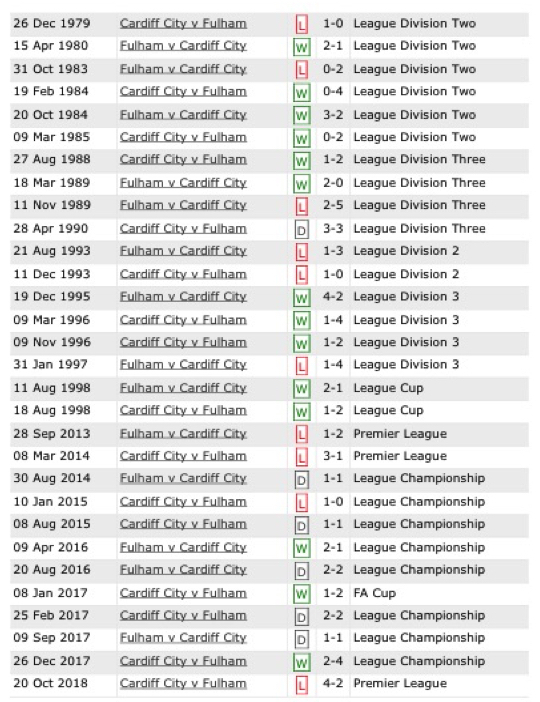 The manner of the defeats though, to me, are the most disappointing aspect and it'll be curtains if things don't change very soon. These players as a collective are just not good enough, Big time Charlies kidding themselves or a talented bunch who just need time? "You would have thought the Match of the Day producers would have earmarked this as a prime contender for the last game on tonight - but it's been an unexpected thriller. I'm looking forward to another visit to Cardiff It's a great place and the inhabitants are a friendly and welcomig lot, though we have a mixed bag of results against their football team. Last season, when we were desperately trying to play cath-up with Warnock's team,we drew in the away fixture as was the case in the previous season so this time around a win would be most agreeable. .